The Lonely Planet guide to South America mentions Barranquilla in a few short paragraphs, remarking on its famous Carnaval, and describing the city as “one big traffic jam.” Living here for the past year, admittedly there are few things to do, but the city has some interesting attractions worth noting, like the Museo Romantico. A trip to the Museo Romantico on a breezy Wednesday afternoon was a leisurely walk from Portal del Prado, just past Universidad Simon Bolivar. The gorgeous Centro Cultural Comfamiliar del Atlantico, located next to the museum, is a reminder that, despite its reputation as a party town, Barranquilla is a city with some sophistication among its festive atmosphere. 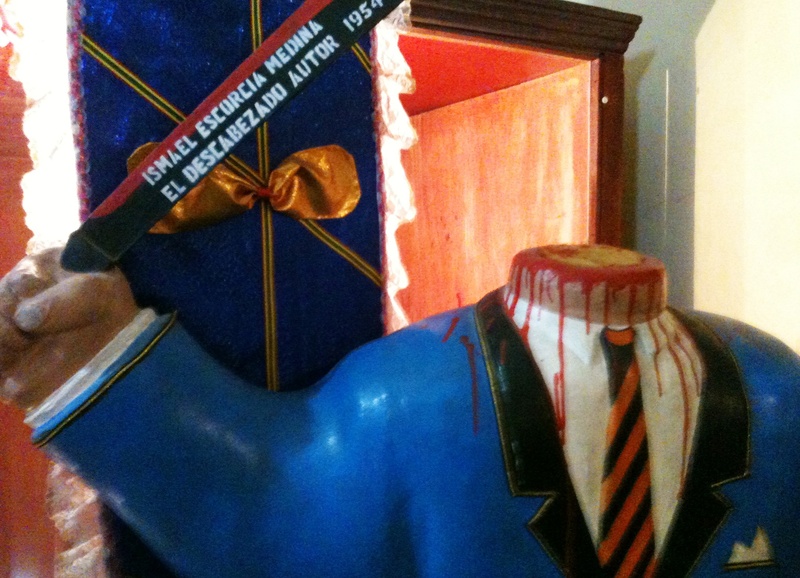 After receiving the $10000 COP (required) “donation,” a museum docent turned on the lights to a small room, revealing life-sized cardboard cutout of Gabriel Garcia Marquez, as well as a thick, concrete statue of the celebrated author’s smiling face and upper body wrapped in a silky Colombian flag. Posters and paintings of Marquez share wall space devoted to Spanish-born painter Alejandro Obregón, and journalist/activist Josè Felix Fuenmayor, and glass book cases house various editions of Marquez’s titles, including Cien Años de Solituda and Vivir para contarla. Among this rich collection of original material published by The Barranquilla Group – writers, journalists, and philosophers who congregated in the city during the twentieth century – are newspaper clippings in albums following the activities of the group throughout their most active years. Moving through the museum, the adjacent room holds archives of the Himno de Barranquilla including what appears to be the original manuscript on brown, tattered paper. Written by Amira de la Rosa in 1942, the hymn celebrates Barranquilla’s beauty and potential as a growing port city. A large painting of conductor Ezequiel Rosado hangs on the wall over an antique piano layered in lace doilies and dust. Watch a video with many photos of life in La Arenosa and listen to el himno here. Amira, is that your funeral dress? Next to the hymn room, a large office space filled with aging electronics and artifacts of technology – several rotary dial telephones, tube televisions and typesetting equipment – emits a slightly metallic, mildewing plastic smell, vaguely comforting and similar to that of a basement library or ancient printing press. Beyond two large wooden doors, a wide hallway features several mannequins in glass enclosures, dressed in gowns from past Reinas de Carnaval, as well as Jesùs and some unusual, demon-like creatures. Throughout the bottom floor of the Museo Romantico, the eclectic method of organization in some appears to be “put that next to this”; surprisingly, this keeps the museum from being boring: as visitors eyes dart from one unique “treasure” to the next, they combine to make this a unique establishment featuring a diverse collection of artifacts. The second floor of the museum has several displays ranging from beautiful dioramas of Barranquilla to peculiar exhibits of military and naval history. Nearly half of the floor is dedicated to a presentation by the CUC, featuring the evolution of Barranquilla as the 4th largest city in Colombia, with miniature replicas of the area when it was first settled to its current, modern day inhabitation. The military and naval rooms hang heavy with a slightly musty gunpowder smell. Heavy artillery, uniforms and historic newspapers evoke gloom, but turn the corner and suddenly you are surrounded by the colors of Carnaval, Barranquilla’s most popular annual cultural event. The Museo Romantico appears to have the humble need for resources mixed with the charm of original, historical objects. From scary clowns and Cumbia dancers to muñecas and Reyanos, a visitor could get lost for hours among the wigs, fabric, sequins and bows of original Carnaval costumes worn by aging, dated mannequins. With its unique artifacts and curious smells, the Museo Romantico is worth a visit, but considering its dim lighting and eerie mannequins, it is questionable if any visitor could spend an entire night here.